The red grape variety comes from Italy, The name may derive from "Berberis", an alcoholic beverage from barberry berries with similar sour taste. Synonyms are Barbera Amaro, Barbera a Peduncolo Rosso, Barbera a Peduncolo Verde, Barbera a Raspo Rosso, Barbera a Raspo Verde, Barbera Amaro, Barbera Black, Barbera Crna, Barbera d 'Asti, Barbera di Piemonte, Barbera Dolce, Barbera Fina, Barbera Forte Barbera Grossa Barbera Mercantile Barbera Nera Barbera Nera Caule Rosso Barbera Nera Caule Verde Barbera Noir Barbera Noire Barbera Nostrana Barbera Rotonda Barbera Barberone Blue Barbera Gaietto, Nigruz, Lombardesca, Sciaa and Ughetta. 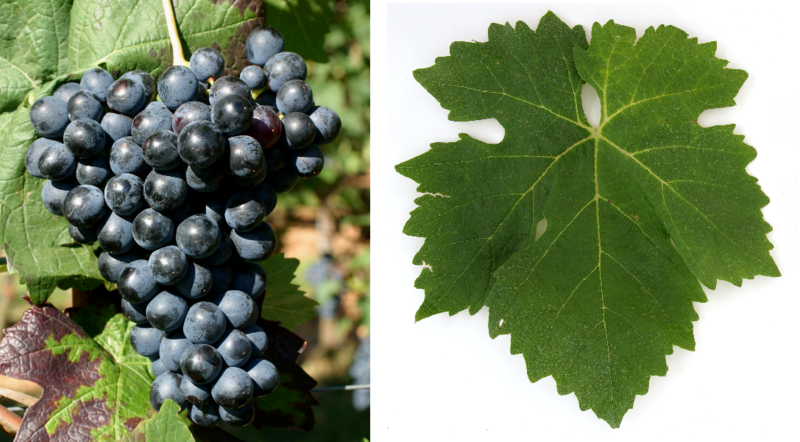 It may, despite seemingly suggestive synonyms or morphological Similarities do not match the varieties Barbera del Sannio. Barbera Sarda (possibly related), Barberùn. mammolo. Neretto Duro (Barbera Rotonda), Perricone or Vespolina (Ughetta). There are a few legends about the origin of the certainly very old variety. Supposedly it was already in the 7th century by the Lombards in the Piedmont introduced. In a document of the municipality Casale Monferrato in 1255 a variety "bonis vitibus barbexinis" is mentioned. This is not, as often suspected, the Barbera, but probably Berbesino, a synonym for Grignolino, The scholar Petrus de Crescentiis (1230-1320) cited in his published in 1304 plant a variety called Grissa, which may have been the Barbera. And in one ampelography Count Giuseppe Nuvolone-Pergamo (President of the Società Agraria di Torino) said that the Barbera variety was cited in 1798 as "Vitis vinifera Montisferratensis". The actual identity of these three grape varieties is not secured. After Phylloxera disaster began in the early 20th century, the triumphal procession of Barbera, which eventually developed with over half of the vineyards in Piedmont to the local "Volkstraube" and in Italy in the early 1990s still occupied 50,000 hectares. In the mid-1980s, she was unfairly discredited as cheap Barbera mass wines methanol (Methyl alcohol) and there were 30 deaths. Barbera is the most common variety in the world with around 60% share Piedmont, but also in the Lombardy and Emilia-Romagna grown. The Italian acreage totaled 20,524 hectares. The late-ripening, high-yielding variety produces ruby-red, acid-red wines with gentle red wines tannins and cherry flavor. With appropriate yield reduction and recommended barrique expansion, it has good quality and storage potential. Among other things, it is often the dominant variety in the DOC / DOCG wines Bardolino. Barbera d'Alba. Barbera d'Asti. Barbera del Monferrato, Casteggio. Cerveteri. Colline Novaresi. Colli Perugini. Colli Piacentini. Falerno del Massico. gabiano. Garda. Malvasia di Casorzo d'Asti. Molise. Nice. Oltrepò Pavese and Valsusa authorized. Likewise she is in many Italian IGT wines used. There are more stocks in Slovenia (134 ha), Greece. Northern Macedonia and Israel, Italian emigrants introduced them to the year 1880 California on. Of the former 7,000 hectares, only about 2,500 remain today. In the United States occupies a total of 2,798 hectares. Smaller stocks are also available in Argentina. Australia (116 ha) and South Africa (51 ha). The variety occupied in 2010 a total of 24 178 hectares of vineyards with a strong declining trend. Compared to 1990, at that time 67.987 hectares, there was an extreme reduction of around two thirds. It thus proved in the worldwide varieties ranking the rank 36. This page was last modified at 4 April 2019 at 08:54.